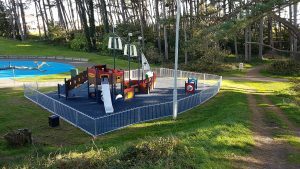 The main feature of the Silloth Green Play Area is the custom built ship which has been specially designed to offer many inclusive features and is classified as DDA accessible. In particular, the frigate has an open design which allows wheelchair users to enter into the central area of the ship through the large entrance gaps. Underneath the ‘poop’ deck there are a number of games panels including a ships wheel, manipulative items, a hammock, shop counter panel, crawl through tunnel (which can also double as a peep hole). At ground level there are a variety of panel games which are fully accessible from a wheelchair and include a musical play panel, another ships wheel, canons, clock panel etc. The upper deck is accessed via a fully enclosed DDA staircase where there are further games such as binoculars, loud hailer and peep through windows. Outside the frigate, a variety of play panels have been included for children of all ages and abilities and are set at a height which is easily accessible for a child in a wheelchair. There is also rubber wetpour safety surfacing which provides easy, level access for pushchairs or wheelchairs to move around the play space. 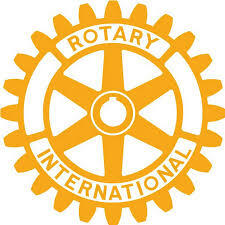 There are a large variety of activities that a child confined to a wheelchair can utilise within this play space. 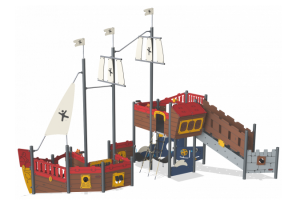 The open layout of the ship lends itself well to allowing children of all capabilities to join in imaginative play games both inside and outside the ship, which is vitally important to provide an inclusive play environment for all children.